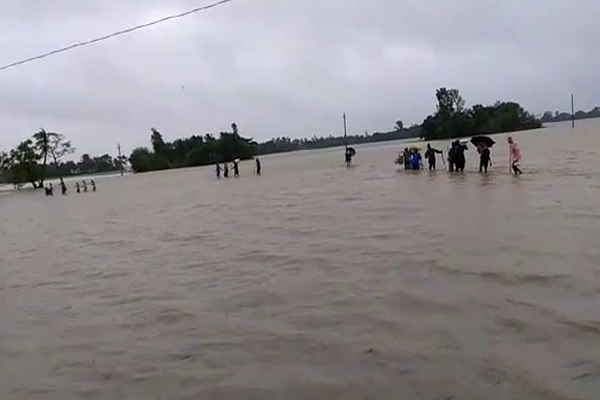 Bhubaneswar: Flood-like situation has occurred in the districts of Mayurbhanj,Jaipur, Bhadrak and Kendrapara due to swelling of the Baitarani river. According to reports, villages in as many as 14 blocks under the four districts are likely to be affected. The district administrations have cancelled leave applications of all Government officials in view of possible floods. The Government has directed to deploy ODRAF and NDRF teams and keep boats and lunches ready at vulnerable places. The river is flowing above danger level at Akhuapada in Bhadrak district. The water level was recorded at 18.48 metre against danger level of 17.83 metre there. Hundreds of acres of agricultural fields under Dhamnagar and Bhandaripokhari blocks in the district have been submerged for over a week now. Road communications have been snapped in many villages too. Meanwhile, the Bhadrak district Collector has visited some affected villages and taken stock of the situation.